I am currently situated in a gorgeous kitchen, overlooking mountains, pomegranate fields and a beautiful private pool ... mmmm villa holidays are wonderful. My boyfriend and I, are in Turkey on holiday with my family (I know, a wonderful form of mild torture/pleasure which he is being subjected too ... going well so far, mostly he is having fun creating havoc with my younger brothers and drinking beer... seems like a good way to go I guess). However, my Dad just can't cope without cake in his life, and well, none of us veer that far from this same point if view, so to speak, ourselves. So I had a first experiment using the facilities here to make a cake. Along with the jeopardy of an unknown oven, there was the added issues created by my complete ignorance regarding Turkish language, and some differences in ingredient availability. 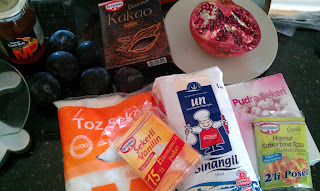 Luckily, we have wonderful hosts, who have helped me out massively by telling me about these things, and writing down "baking powder" in Turkish (as there is no self-raising flour here), and explained that instead of vanilla essence, I will have to use vanilla sugar. It turns out that it is pomegranate harvesting time here, oh what a happy coincidence! And the couple who own the villa have stocked us up with some pomegranates which they have been given by the farmer owning the fields surrounding the villa. I kid you not, some of these pomegranates rival my head for the largest spherical object in the house! They are beautiful, and so fresh. Of course I couldn't waste this opportunity, so along with some fresh local plums, I thought ... upside down cake!!! 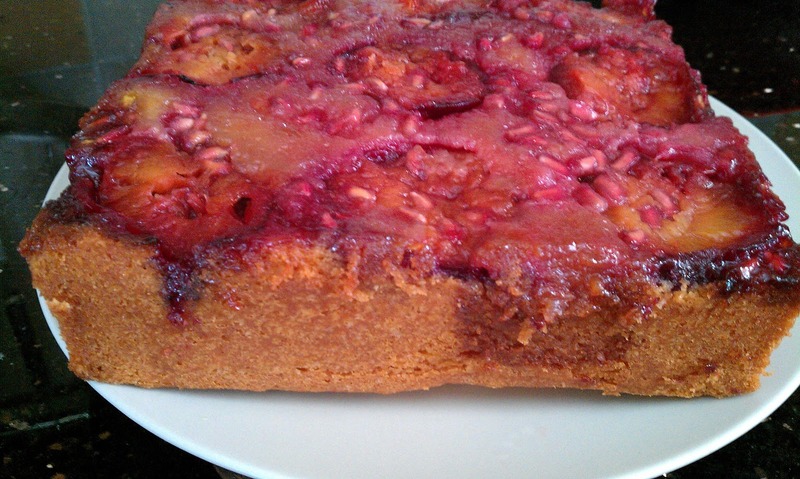 I haven't previously made an upside down cake, so I had a quick google search and looked around at recipes for general guidance, then went ahead and made it up as I went along. 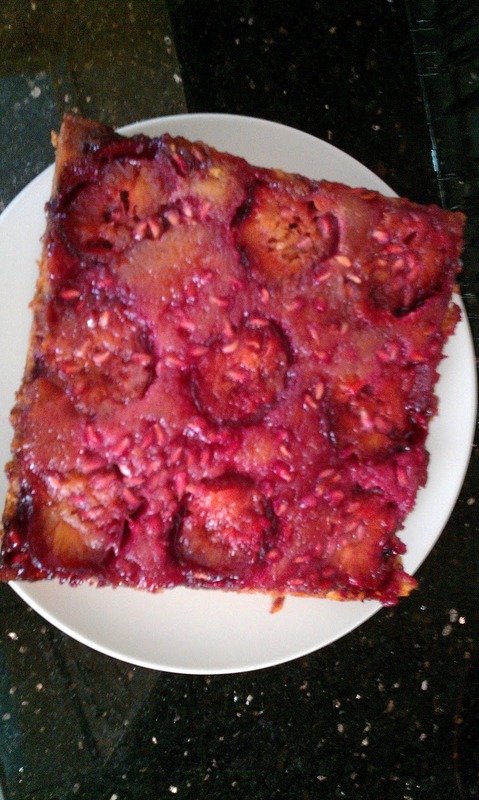 I put melted butter and sugar in the tin then laid out the fruit elegantly, and made a sponge mix, which was then placed over the top. The cake was then baked, which took longer than I had anticipated (about an hour total), but with the aid of some interesting foil backed with some kind of brown paper (I have no idea what this is?? But it seemed to work ok as a non stick lining, having gotten this one completely wrong, thinking it was normal baking paper), I managed to get there in the end. The cake rose well (phew) and tasted rather pleasant indeed! 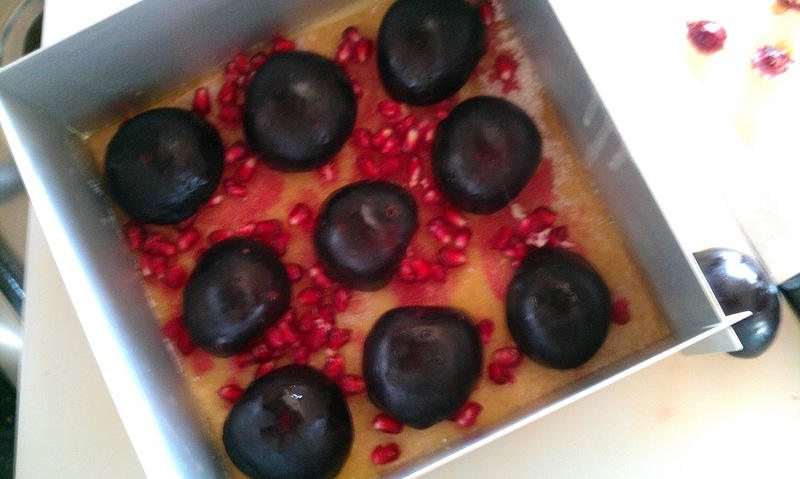 I can certainly recommend pomegranate with plum as a combination, and doesn't it just look sooo appetising!